What Does Homocysteine Have to Do with Lower Cholesterol? Homocysteine is in short an amino acid. It has been linked to people with cardiovascular disease. In other words, high levels of homocysteine in the blood are found in people with heart disease. Elevated levels of homocysteine have also been linked to arterial disease as is true of high levels of cholesterol. If lowering homocysteine levels and lower cholesterol were to occur the risk of arterial disease would also diminish. It is important for those with high cholesterol to have their homocysteine levels checked as well since there would be an increased risk of arteriosclerosis and cardiovascular disease. Failing to lower cholesterol by itself can lead to serious problems with the arteries as the plaque from excessive amounts of cholesterol in the arteries forms on the artery walls and blocks the free flow of blood. Blood needs to bring oxygen to the other organs of the body and it can’t do that efficiently if there is too much blockage in the arteries. In addition, high levels of homocysteine actually change the Low Density Lipoprotein (LDL) cholesterol in the bodyl into what is called oxidized Low Density Lipoprotein. This oxidized version is even more damaging to the arteries than excessive amounts of LDL. So not lowering cholesterol and having high levels of homocysteine in the blood leads to a greater risk of stroke. This is because high homocysteine levels causes blood to clot more and further block the arteries. The medical field is in agreement that most cases of elevated homocysteine can be treated through a proper diet. The same is true of lowering cholesterol levels. Diets rich in folic acid and B complex vitamins help control homocysteine and cholesterol levels. 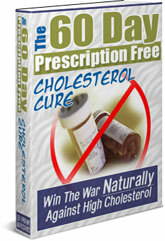 A complete drug free plan is explained in The 60 Day Prescription Free Cholesterol Cure.